The Seven Cedars was once a dairy barn, then later a roller rink before becoming a dance hall. I have two older sisters, one graduated in 58, one in 61, and I graduated in 65. Seven Cedars, "The Stumps" affectionately referred to the place we, during our high school years, looked forward to every weekend. The music has been unparalleled to this day. I was at the dance the night it burned. We were having a wonderful time and all of sudden smoke started rolling onto the dance floor at the edges where the walls and floor meet. Everyone knew immediately what was happening and all exited without panic. We had been through a million fire drills at school, so even though I knew my purse and coat were checked, I would not even ask to retrieve it. We exited quickly, without much conversation, and within minutes it was engulfed by a blaze of flames. Words couldn't at that time and still don't fit what a loss we felt then and realize today. You can move the bands and the kids, but you could never come up with the ambiance and connection that young people responded to at that rockin dance floor with the best dance music this state has ever seen. What I realize now, and didn't then, what lucky young people we were to have access to live music every week in a safe place set aside for them, monitored by caring adults. Not so today. Thank you to all who were instrumental in contributing to the best of times in my and so many of my peers' memories. The Dynamics were on stage the night the Seven Cedars burned down. I used to work at and dance at the Seven Cedars teenage record hops in the late 1950's which was located on Riverside Drive. 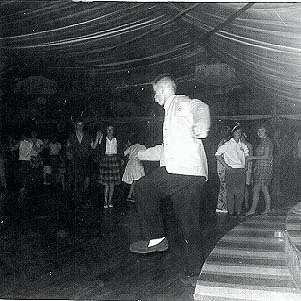 Harry Lindbeck and his orchestra started holding dances at the Seven Cedars on October 7, 1944. Jim Nelly, a native of Tacoma, WA and a disc jockey at KBRC radio 1430 on the dial in Mount Vernon started the record hops, probably in 1958, that were held on Friday nights. Admission was just $1.00 per person. 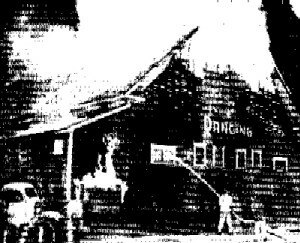 The stumps burned at 8:45 PM on Saturday, September 21, 1963 and Randy Craig was the manager of the Saturday teenage dances and I suspect, but have not verified, that he worked for Northwest Rock 'N' Roll legend Pat O'Day. Two local bands that performed here were the Esquires from LaConner and the Maddy Brothers from Snohomish (www.maddybrothers.com). There were other Northwest bands, but I have to verify them. Of course Barbara, Gary and Gretchen, The Fleetwoods, performed there just as Come Softly To Me was breaking nationally. 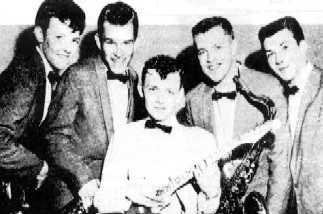 The Diamonds, Gene Vincent, Carl Dobkins Jr, Randy Sparks and Bobby Darin all performed at the Seven Cedars. There was another dance hall in Skagit County, four miles North of Burlington, on old Highway 99 just North of the Samish River named the Holiday Ballroom. The Holiday was also destroyed by a fire. Vancouver, B.C. disc jockey Red Robinson from CKWX 1130 held several teenage hops at the Holiday with such acts as Ritchie Valens and Robin Luke. My Senior Ball was held there (Mount Vernon High School Class of 1960). I fondly remember attending my one and only dance at Seven Cedars. I had turned 13 and I had asked my father numerous times if I could go to the dances there and his answer was always “no”. I guess he wasn’t sure of the type of people that attended the dances. I gave up asking him until the day I found out that Bobby Vinton was going to appear there. I asked him once again and he said, “Do you really think that you should go”. I said “yes”. He let me go. I was shy and naïve and I remember waiting anxiously for Bobby to appear while in the interim I was being chased around the dance floor by one guy who I really didn’t want to dance with. I took a piece of paper with me, so that I could get Bobby Vinton to sign it. He came on stage and sang a couple of songs; “Roses Are Red” was the one I wanted to hear. After his appearance he came down into the crowd and I handed him my piece of paper for a signature, but he took out his photo instead and signed it for me. That was my one and only experience with Seven Cedars and apparently the only one that I needed as I never went back. Aren’t memories terrific? My Grandfather was the Fire Chief for the City of Mount Vernon the night the Seven Cedars burned. My Father was a teenager then and was at the Fire Hall to help make sandwiches and such during the fire. While my Father was helping at the Fire Hall one of the Fireman asked my Father if he had ever driven a fire truck and before he could answer my Father was sitting in the drivers seat of the last pumper not at the scene and was told to head there. 37 years later my Father retired as the Fire Chief for the City of Mount Vernon. My Grandfather served for over 35 years and retired as Fire Chief also. Another interesting fact is that my Mother's Mother (my Grandmother) was the punch lady that night and was the first to alert the management that she smelled smoke. 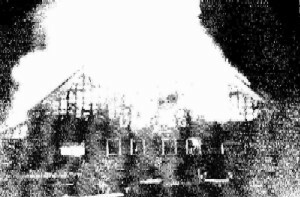 One of your other writers mentioned that the smoke was coming from the edges of the floor when in actuality the fire and smoke was coming through the floor registers and as it was an old WOOD barn it went up quick. The weird thing is my Mother and Father did not meet until 4-5 years later. We still have the original newspaper clippings of the fire. The 7 Cedars stood where the Safeway is now in Mount Vernon as it was all farmland then. This really brings back memories. I went to Seven Cedars many times in the late Forties as well as Homers Barn, and places I have forgotten the names of in Lake Stevens and Stanwood. I was at The Stumps every Saturday night from around 1953, then the Army from 56 to 60 or so. Stan Boreson and Harry Lindbeck had the band there with Herb Benthene on the clarinet. Herb's daughter Cheryl has been been with the Manhatten Transfer for many years. I would give about anything have one of those nights back. Hell even sitting in my '28 Buick or '36 Ford drinking cheap whiskey in the parking lot would be a doer. How about a 7 Cedars reunion or are we all too old? 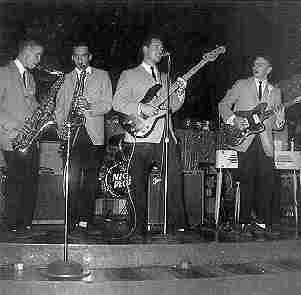 In 1963 the “Exotics” were playing at the Seven Cedars in Mt. Vernon! We started playing at 8 PM and around 8:30 I smelled smoke. We had a few roadies, friends, in the audience and I asked one to check out the restrooms to see if someone had set a trashcan on fire! He came back and said no! As we started the next song, the smoke became more intense and we started to panic. All of a sudden a wisp of fire shot up out of the center of the dance floor. The audience came up and grabbed our amps, guitars and our instruments and PA system. Walt and I were the last two out carrying his portable electric piano. When I started breathing fresh air again I saw my new, well new to me, 56 Mercedes 260S sedan, parked head in by the door. Mercedes Benz had a key for the Front doors, the Parking brake, the glove box, the gas cap, the trunk and the ignition. Since I had just purchased the car, I didn’t know which key opened the door. Three or four firemen picked up the back of the car and pulled it backward to a safe place for me to find the right key! Recently we attended a birthday party at the Edison Inn/Tavern and one of the attendees came up to me and mentioned she had my autograph in her book. She had been working at the Cedars (Seven Cedars) the night we performed Come Softly To Me. I thought that place was the neatest place we ever sang, bar none. Her bringing up the Cedars aroused my curiosity and had to Google to find what was on the internet about it. We moved up to Anacortes from Olympia in 1964 and I started working as a casual longshoreman eventually making it into the union and am now retired. My wife Jenifer worked as the assistant finance director for the City of Anacortes and is also retired. We now live in Bayview. Her uncle Charlie Townsend built the Guemes Island Fishing Resort back in the 40's. She and her family used to vacation there regularly.